Before lensing Obvious Child, director Gillian Robespierre and cinematographer Chris Teague looked at only a handful of films for reference. They peeked at Woody Allen’s 1970s and 1980s work and glanced at Lena Dunham’s 2010 film Tiny Furniture. But when it came to slogging through romcoms, Teague didn’t see much point in subjecting himself to hours of Notting Hills in order to familiarize himself with the genre’s cliches. “The script for Obvious Child was so far from any mainstream romantic comedy that I wasn’t concerned that we’d make anything that felt like that,” Teague said. Obvious Child announces its uniqueness in its opening scene, when New York stand-up comedian Donna (Jenny Slate) delivers an extended bit about vaginal discharge. The moment instantly shatters the romanticism that so often defines the genre and grounds Obvious Child in a reality central to its protagonist’s journey toward an abortion following a one-night stand. With Obvious Child recently making its way to home video platforms, Teague spoke to Deep Fried Movies about presenting a realistic New York, crafting his own lighting fixtures and making the most of last-minute location changes. Slate stakes out her ex-boyfriend’s house in an early scene from Obvious Child, which was shot over 18 days using a Red Scarlet. I studied photography in high school. I loved the process of shooting, processing and printing black and white film. I didn’t really see the connection at the time, but I also borrowed my parents camcorder and used it to document the high school antics of my friends. This process developed over the years, from simple observation to improvised stories, and finally to writing and acting in our own scripts and teaching myself how to edit on Final Cut Pro 2.0. We looked at filmmaking more as a way to entertain ourselves, a fun construction project intended to get laughs. 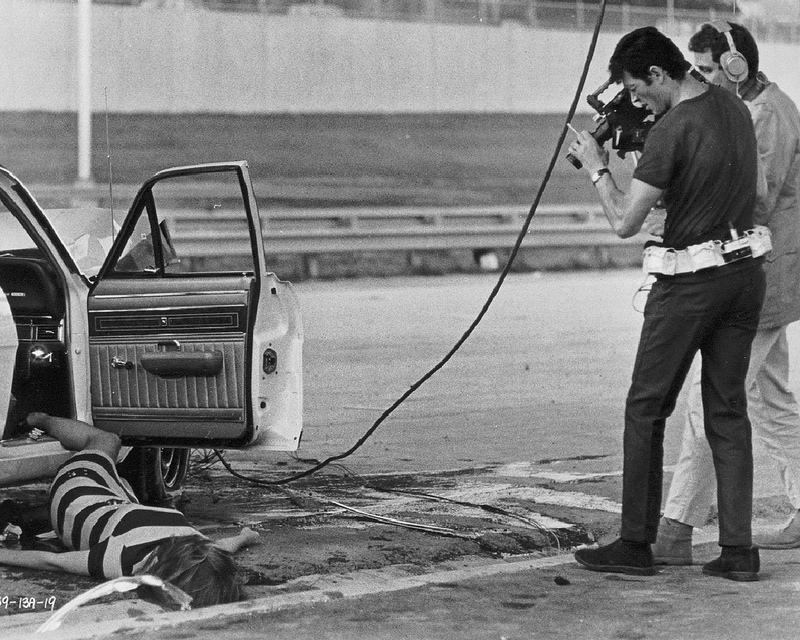 A production still from Haskell Wexler’s Medium Cool (1969). Who was the first cinematographer or filmmaker whose work had a conscious effect on you? This is not particularly original, but Stanley Kubrick was the first person to make me aware that photography could have a vital impact on visual storytelling. I found, and still find, that his use of precise composition, his smart but simple approach to editing and his aesthetic boldness get me incredibly excited about how movies can make you feel. On the flip side, Haskell Wexler’s Medium Cool was a big influence for me. It opened my eyes to the power of combining fiction with non-fiction and the power of an untethered, observational camera. One trope of the romantic comedy – particularly those set in New York – is that the characters live in an idealized version of the city in ridiculous apartments they could never afford with whatever kooky job they have. I love how Obvious Child takes place amid graffiti covered bathroom walls and apartments with window air conditioner units. It’s funny because when you’re making a movie about characters that live in a world very similar to your own, characters that you feel like you might be friends with, you don’t necessarily see the locations that they live, work and hang out in as “creative choices”. They are more like places that feel familiar. We almost shot in Gillian’s apartment for Donna’s apartment. So this is a version of New York City that feels right to us, and I guess in trusting your own personal experiences and associations with your home you become unknowingly confident in the idea that you are representing something that feels real, which is obviously very important to the story. One of the many things that makes the story work is its specificity – that it’s about this one person going through this one experience, and if that story is told with a respect for the authenticity of the world of that character, then that one character’s experience can become more universal. A homemade DIY lighting fixture constructed by Teague. In past interviews you’ve spoken about your enthusiasm for making DIY lighting fixtures. What were some of your creations for Obvious Child? My new favorite thing is this tiny little spotlight that I built, which is basically a hose clamp around a loop of armature wire and a ceramic MR16 light bulb base. 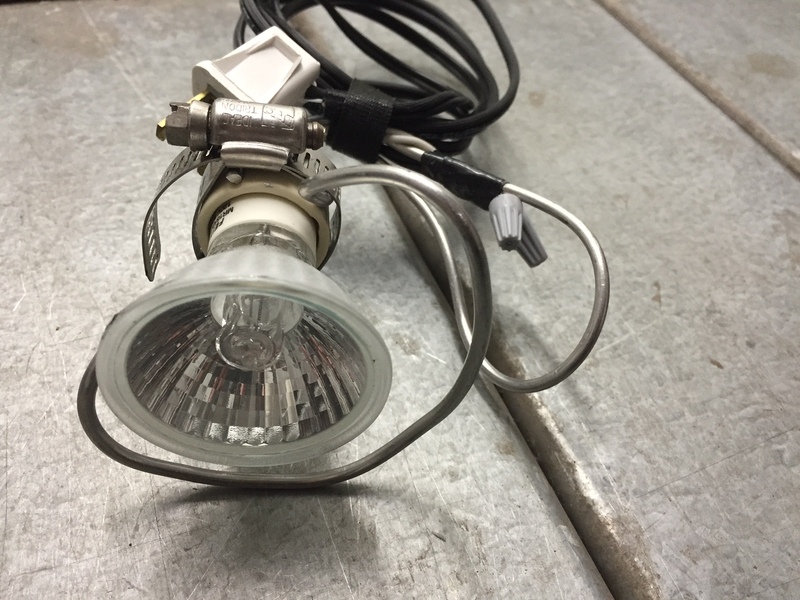 MR16 bulbs are the same things used in track lighting, and if you get the ones with a GU10 base you can wire them up directly to a 110V plug. They are so light that you can paper tape them to walls or ceilings and they are so small that they can be in the background of bar scenes and not look like a movie light. I have a whole box of them and they are very cheap to make. Just be safe and careful with your wiring. I’ve used them mostly in bars, to backlight actors and background actors, or to put little washes of light on walls. Their reflectors are not very good, so the beam is broken and uneven, which I like because that’s what lights in the real world look like. You used Cooke Panchros and your own Red Scarlet on Obvious Child. Talk about those tools. The Scarlet is a fraction of the price of the Red Epic, yet I don’t hear much about it being used on features. We used a set of Series II and Series III Cooke Panchros that probably date back to the 60s. They do have the original coatings on them and most of them are a T2.3 or T2.2, but I generally shoot with them at a T2.8 as they tend to get pretty soft and hazy wide open. It’s very hard to describe the character of a lens. We often describe the Cookes as warm, soft and organic, which are incredibly general terms. And then we shoot tests and stare at these tiny variations in edge softness, color and contrast, which feels like a very microscopic approach. I try to combine the pixel-peeping nerdiness with a gut reaction to come up with a good assessment of how a lens feels. The main tradeoffs with the Scarlet are that you can’t shoot 5k at 24fps, which is not much a tradeoff for me, and that you can’t really do slow motion at 4k. The sensor and codecs of the Epic and Scarlet are identical. The camera bodies are identical. The image a Scarlet makes at 4k 24fps looks identical to an Epic at 4k 24fps. Lots of people don’t seem to understand that there’s no difference at those rates and resolutions. Chris walks us through a few shots from Obvious Child. Obvious Child opens with Jenny Slate’s character in the only environment she seems comfortable – the stand-up stage. How did you approach lighting that space? We wanted something simple and relatively unadorned for the comedy club scenes. We actually borrowed a lot from the scene in Annie Hall where Diane Keaton’s character is singing in the club. The purple color comes from that. We didn’t want it to feel like the club had spent too much time thinking through how the space would look, so we tried not to space lights evenly. That space (Trash Bar in Williamsburg) had a lot of red in it already and it felt right to add that into the scene. We meet Slate’s character’s parents in back-to-back scenes and the color temperature of those spaces (warmer for dad, cooler for mom) says a lot about Donna’s relationship with each. Yes, the color in the scenes with Mom and Dad was definitely a reflection of their relationships. It helps that the scene with Mom is in the kitchen, where a bit more cool/neutral light makes sense. The whole move is super warm, though. I tend to go in that direction. The kitchen scene with Mom just isn’t as warm as the others. It’s interesting how your eyes adjust to a color bias after some time. This scene between Donna and her OBGYN is a pivotal moment in the film and covers more than three minutes of screentime. Yet you keep the coverage very simple. Talk a little about your approach to coverage in this scene (and the movie in general) – you definitely opt for a style of less is more. The power of this scene is in how frank and direct it is. If we did anything with the camera, like a push in on Donna as she’s realizing how difficult having an abortion is going to be for her, the audience would have felt the presence of the filmmaker trying to guide their emotional reaction. From a visual perspective, I would have loved to have shot that scene in a larger, more interesting looking space. But we shot in a real Planned Parenthood office and those conversations occur in rooms like that. It wouldn’t have felt honest to do it in another space. I don’t always go for a less is more approach. The Mend, which premiered at SXSW this year and was brilliantly directed by John Magary, was shot in a completely different way. We used every style of camera movement we could afford and imagine to create a very different visual energy. The visual approach has so much to do with what the story is and what the director is interested in. To the eye, this shot of Slate and Jake Lacy (who plays the father of Slate’s unborn child) appears to be lit by available sources – the sun as his backlight/her key; the lamp as her backlight/his key. What did you do to augment the light for this shot? For this shot we had a large daylight source (Joker 800w HMI in a 5 foot Chimera Octaplus) to carry the daylight further into the room, and a smaller tungsten source (1000w Small Chimera) to amplify the light coming from the lamp. We probably used some other additional sources to help fill things in or wrap the light around faces. I love full shots, but they don’t seem to get used very often. Talk a bit about how you devised this shot, which is one of the more formal images in the film. We lost our location for Donna’s mother and father’s apartments only days before we were meant to shoot in them and our fantastic producer Liz Holm was able to find us this new place just in time to shoot, but it meant we had to rethink all of our shots. If I remember correctly, we were talking through things and Gillian said we needed a full shot so we could see Donna’s crocs and my first thought was, “How the hell are we going to get a good full shot in a New York apartment?” Then I turned around and saw this great long hallway behind me and it turned out to be perfect for what we needed. This shot shows Donna’s boot-ied feet amongst other female patients’ at the clinic. Is this an image that was found on the day or was it preplanned? And at that height I’m guessing you simply placed the camera straight onto the ground? I believe that Gillian had the image in her head of all the booties lined up before I even came on board. I think it was just one of those details that stuck out for her. I had always imagined them lined up in a curved row and yes, to get that angle we just put the camera on the floor and leveled it with wedges.